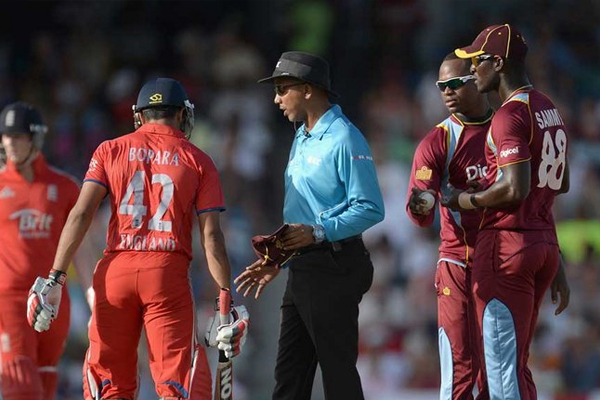 Dubai, United Arab Emirates – England’s Ravi Bopara and West Indies’ Darren Sammy and Marlon Samuels have been fined for a level 1 breach of the ICC Code of Conduct during the first Twenty20 International (T20I) in Barbados on Sunday. The three players were found to have breached Article 2.1.8 of the code, which states: “Where the facts of the alleged incident are not adequately or clearly covered by any of the (above) offence, conduct that either: (a) is contrary to the spirit of the game; or (b) brings the game into disrepute”. All the three players pleaded guilty to the offence and accepted the sanctions proposed by Andy Pycroft of Emirates Elite Panel of ICC Match Referees, so there was no need for a formal hearing. The incident took place in the 12th over of England’s innings when Bopara, while taking a single, made insulting comments towards Samuels, who responded. West Indies captain Sammy joined in, also trading insults with Bopara. The exchange only ceased with the intervention of the on-field umpires Joel Wilson and Peter Nero. For their involvements in the incident, Bopara was fined 25 per cent of his match fee, while Sammy and Samuels were fined 20 and 10 per cent respectively. Besides the on-field umpires, the charge was also laid by third umpire Gregory Brathwaite as well as fourth official Nigel Duguid. All Level 1 breaches for this offence carry a penalty of a warning/reprimand and/or the imposition of a fine up to 50 per cent of the applicable match fee.